I would so love to hear your comments about this video below. Do you like recipe videos like this? I create this content for YOU so knowing what you like, what supports your healthy eating, and what you enjoy sharing with your friends will help me in creating more things that you love. Thank you in advance for your feedback! Now, back to chia pudding. 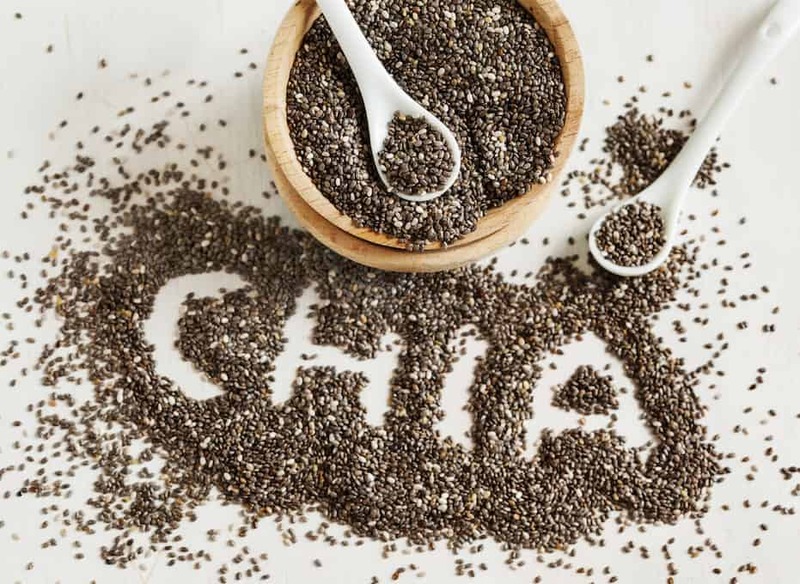 Chia pudding has blown up on food blogs over the last year or two. Have you tried it yet? You basically mix chia seeds with non dairy milk and any flavor/additions of your choice, let it sit a few hours in the fridge, and then it thickens into a nice ‘pudding’. It’s quite tasty and super healthy! b) create a really thick pudding that you can slice after chilling. It’s perfect for fall with the pomegranate seeds, apple and cinnamon or pumpkin pie seasoning! Sometimes I eat it cold, but I really enjoy heating it up and drizzling it with almond butter and/or a dollop of coconut whipped cream. Yuuuum. If you don’t want any sugar: you can either omit the maple syrup or sub stevia. 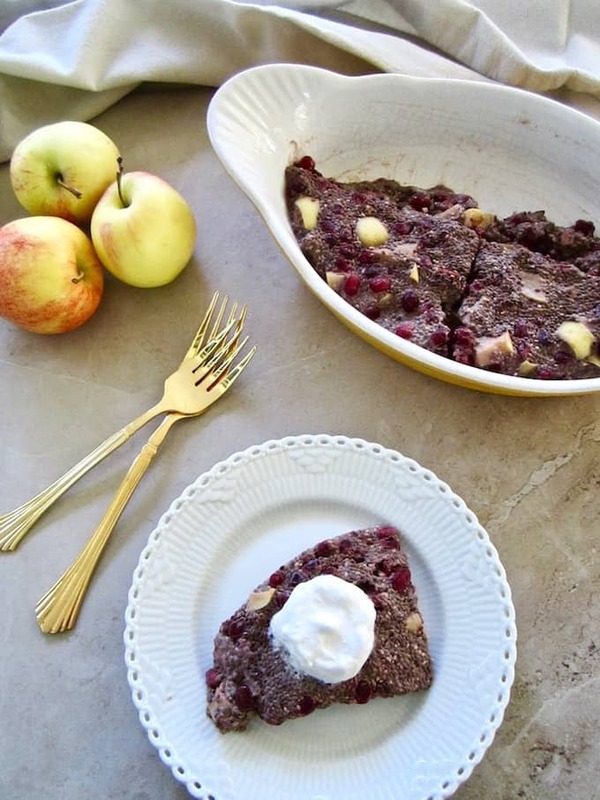 To make this raw: combine all ingredients without heating, using homemade raw nut/seed milk and omit the syrup. P.S. 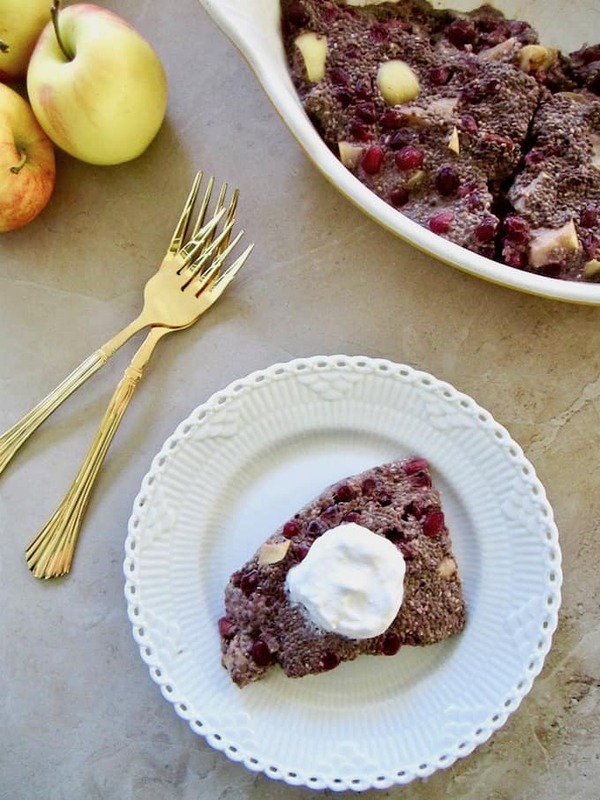 Each serving has 11 grams of fiber and 6.5 grams of protein, and if you add a serving of almond butter (2 tablespoons) that’s another 3 grams of fiber and 6 grams of protein = 14 grams of fiber + 12.5 grams of plant-based protein per slice! 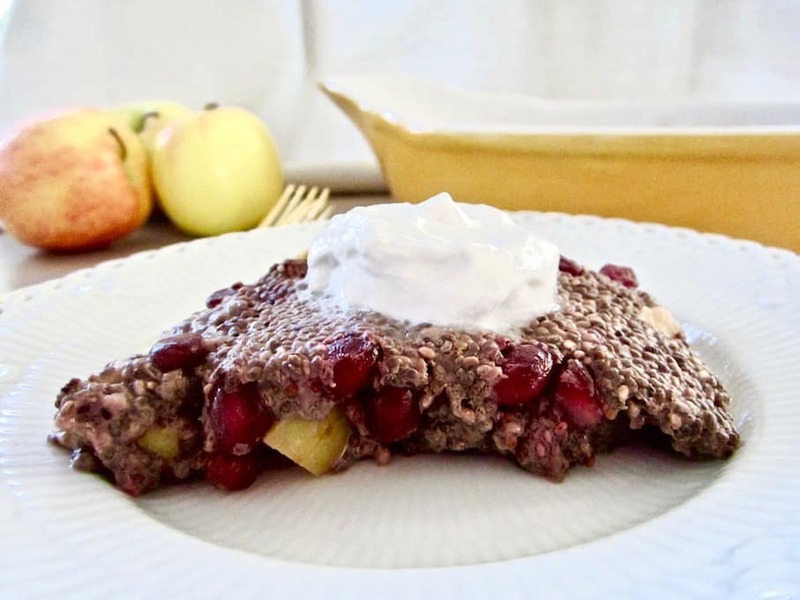 A healthy and easy vegan breakfast or snack (12.5g of plant protein/slice), served warm or cold with coconut whipped cream and almond butter! Add pomegranate seeds, apple, coconut milk, maple syrup and pumpkin pie spice to a pot and let simmer for 8 minutes. Remove from heat and add chia seeds, stirring for about 1 minute. Stir in nuts. Pour into a dish and refrigerate for at least 4 hours before serving. To serve: You can serve it warm or cold. To warm, put in the oven or microwave. Alternatively add heated coconut milk for a more pudding-like consistency and stir. Top with coconut whipped cream, non-daiary yogurt and/or almond butter (optional). SUGAR FREE OPTION: Omit the maple syrup or sub stevia. RAW OPTION: Combine all ingredients without heating, using homemade raw nut/seed milk and omit the syrup. This post contains an affiliate link. If you make a purchase on Amazon after clicking one of my links, your costs stay the same but I receive a small commission to help support Vegan Chickpea. Thank you for your support! Awesome!!! Love the video... can't wait to try the recipe! That's a cool video Sarah! I'm not surprised you also have the video editing talent too!! That pudding looks super tasty!! WOW! another talent you have!!! I actually really appreciate short videos since I am a kinesthetic person and can see what techniques/tools are being used... HURRAH on the expansion of your blog!!! THANKS! !